One of the endlessly cool things about sake is the history. Like many ancient arts, sake brewing has been through countless ups and downs and inside outs which all have an impact on the sake we see today. Interestingly though for sake, despite a history of a couple of thousand years most of the serious developments that shape what’s in the bottle today occurred in the last 100 years or so. Arguably one of the most important developments was the discovery of the sokujo-moto (quick fermentation) method after years of the yama-oroshi/kimoto technique. But there was another method for getting the fermentation ball rolling that is often forgotten; the Bodai-moto. Around the mid-700sAD Nara was the capital of Japan, knowledge of how to skilfully use koji had spread from China and the Shogunate/government at the time had begun to see sake as a serious means of taxable revenue (it had mostly been for ceremonial consumption up till that point). This meant setting up the first Imperial Sake Brewing facility. Sake was brewed by the local Nara monks in temples and it was from this period on that most of the foundations for sake brewing were discovered. Fast forward about 700 years to the Kamakura Period and many different types of sake were being developed and in particular the sake brewed by the Bodaisen monks gained a noticeably high reputation. The Bodaisen was brewed a little different in that it used a small portion of steamed rice thrown in with raw rice and water and left to the elements to create a ferment called “soyashi-mizu”, basically a lactic-acidic water. Lactic acid is desirable/essential in the early stages of brewing as lactic acid kills out other unwanted bacteria which can “turn” the sake. This lactic water was then used as the brewing water in the sake production process. This actually puts the Bodai-moto method closer to the current sokujo-moto in style as they both rely on lactic acid being present at the beginning stage of brewing whereas kimoto and yamahai allow various bacterias to propagate before being wiped out by naturally occurring lactic acid. Sokujo (Quick Fermentation) Method: Lactic acid is manually added to the blend of steamed rice, koji, water and yeast to create the starter mash. Yamahai/Kimoto Method: Lactic acid is created naturally by other bacteria in the steamed rice, yeast and water in order to create the starter mash. Bodaimoto Method: Lactic acid is created with raw and steamed rice mixed with water. This lactic water is then mixed with koji, rice and yeast to create the starter mash. Of course advances in brewing left this Bodai moto technique all but obsolete until a few years back when some of the breweries in Nara decided to revive the technique. Although far from common Bodai moto sake can be found if one looks hard enough. Takacho, brewed by Yucho Shuzo in Nara is probably the most prolific and is I believe also available in some foreign markets. However another I came across recently was an offering from Gozenshu in Okayama. 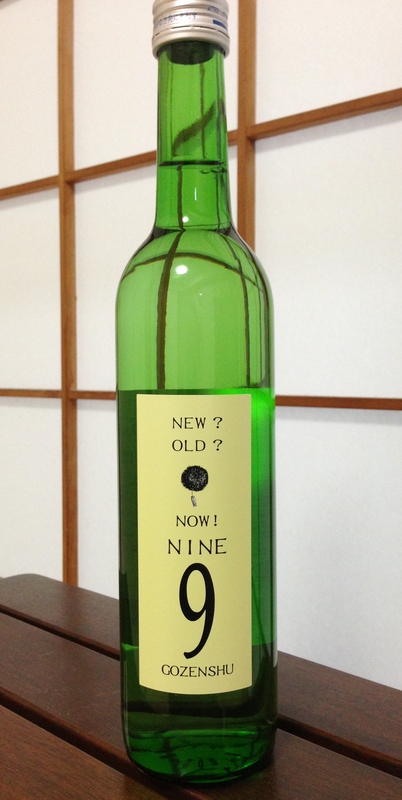 Okayama lays claim to fame as the home of the popular Omachi sake rice variety and none too surprisingly sees its use in this Hiyaoroshi version labelled simply Nine (after the nine members of brewery staff). Aromas are savoury and definitely rice-driven with background hints of earthiness and a niggling touch of shiitake mushroom. On the palate it’s spritely and fresh with a tangy acid profile reminiscent of a kimoto style sake. Again rice driven, this an umami rich brew that drys off slightly peppery in the finish. Balanced and sleek. You’re not likely to come across many Bodai-moto brewed sake but if you do, they’re worth trying as a window into sake of days of old.